Demolition of the contested Draynoff homes in Beit El, in the Binyamin region north of Jerusalem, began toward noon Wednesday. The court ruled that the demolition must be carried out by Thursday at midnight but movement of forces on the ground Wednesday right after the decision indicated that they intend to carry it out immediately. The court rejected the motion for a temporary order preventing the demolition. At more or less the same time in which bulldozers began tearing down the Draynoff houses, a consultation was held at the Prime Minister's Office in which the immediate construction of 300 housing units in Beit El was approved. The 300 units were promised by the Israeli government three years ago after the relocation of the Ulpana houses in Beit El. 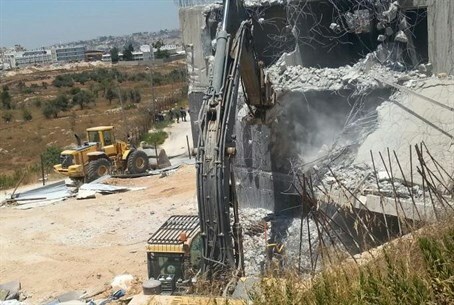 Residents of Beit El were calling for nationalist MKs to collapse the coalition on Tuesday, after security forces stormed the Draynoff compound in the town ahead of demolition despite the nearly completed legalization process for the buildings. Judy Simon, a 15-year resident of the town and also its tourism coordinator, told Arutz Sheva on Tuesday that the two "buildings have been through the entire process of all the proper channels for them to be legalized." "Last week we got our final permission from the (IDF) Civil Administration, and then today we were supposed to go to the Supreme Court in order to request that the discussion be reopened and that the demolition orders be cancelled." But on Monday night, security forces came "like thieves in the night," even while fully "knowing that everything was upright and proper, moments before we were able to put in our request," said Simon. "If the Draynoff buildings in Beit El had to fall, then the government should fall," demanded the irate resident. MK Moti Yogev of the party hinted the Beit El incident may end the coalition, and it appears that it was a threat by party chairman Naftali Bennett to do so that brought Netanyahu to declare the construction of 300 homes. . There has been tension growing in the party, with supporters from Beit El facing off against Bennett to press him to do something about the demolition, to which he told them to protest Likud. The Tekuma faction of Jewish Home has indicated it may take action if the party does not. For its part, Likud's Defense Minister Moshe Ya'alon initially denied giving the order to seize the buildings, while Prime Minister Binyamin Netanyahu has said he opposes the demolition, calling on the Supreme Court to cancel the demolition orders in light of the Civil Administration building permission which has led to a last-minute petition.